mHealth can improve health outcomes in a cost-efficient way, which is especially relevant due to the current financial state of mental healthcare. Nowadays, due to budget constraints and a shortage of qualified personnel, healthcare providers are looking for new ways to reduce administrative processes and improve productivity, with the objective of enabling clinicians to spend more time on patient care rather than processing paperwork. 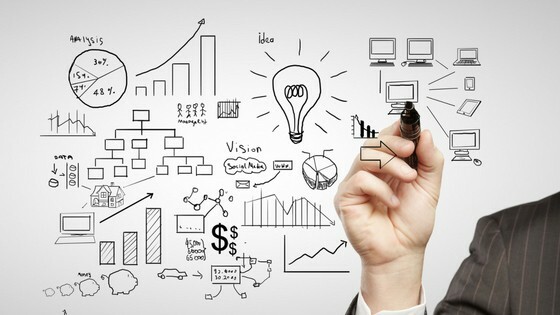 With this in mind, organisations are looking into migrating from paper-based to paperless systems. Mobile data capturing solutions are beneficial for healthcare professionals and patients alike. Since they improve workflow, these tools enable clinicians to spend more time seeing patients. 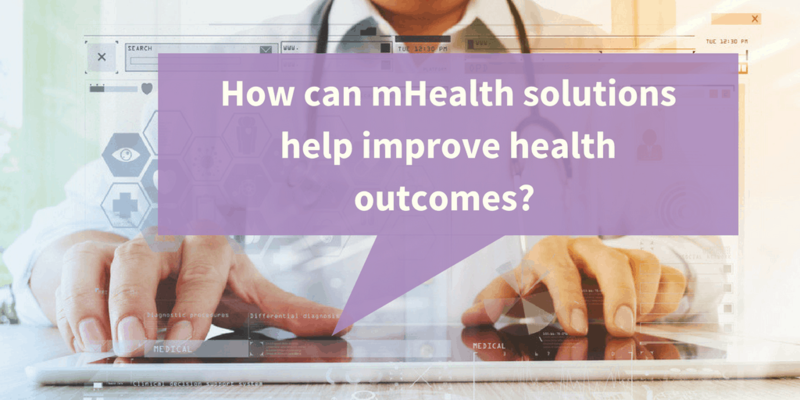 MHealth can improves health outcomes by enabling healthcare professionals to save time by allowing them to access patient information more efficiently, ensuring patients receive better care, wherever they are, even if their primary clinician is not available. Furthermore, communities are looking to form multi-sector collaborations that support their ability to better understand and tackle the social determinants of health. There is a growing need to build capacity beyond the healthcare sector and to find new ways to integrate data from multiple areas with the objective of improving community health. For people with complex health issues, such as those with a severe mental illness, the coordination of medical and community services can significantly improve their quality of life. These individuals often require the most costly treatment and care, therefore many communities are aiming to link the available data between social services and clinical services to provide a more comprehensive care. Linking aggregated data from different sources may reveal information about a particular population group, enabling healthcare providers to develop a more comprehensive understanding of the health factors in a specific community. Measuring health at a more detailed level allows decision-makers from the public healthcare system to recognise differences, plan more effective interventions, and monitor a particular group over time. Academic institutions and non-profit organisations continuously conduct research on specific patient-groups. Since these organisations collect and analyse health-and-behavioural-related data on vulnerable populations, this data could be re-used to address related issues and to drive new healthcare initiatives and policies. In addition to these points, data encryption ensures that all patient information is kept strictly private and protected at all times. International laws require that every organisation accessing patient information should adhere to strict confidentiality conditions. On a previous blog post, we established that patients value mHealth technology; therefore, the sooner healthcare providers embrace this technology, the better. Fortunately, mHealth technology does not only offer benefits for patients, it also solves many of today’s healthcare challenges, since it provides public and private healthcare providers the scalability to treat more patients with fewer resources. A lack of budget may seem like the largest impediment to acquiring digital health tools and necessary technology. However, this should be considered as a valuable investment. One of the most tangible benefits of using portable, real time updated, mobile health technology is its consistent availability for patients and clinicians. Our mHealth solution synchronises the data from the patient’s smartphone to the clinician’s web portal in real time. Patients can feel connected to their treatment and their clinician beyond scheduled sessions. mHealth technology can ultimately record more data and information regarding the patient’s progress than old pen and paper methods, and provide availability and support for the patient when the clinician cannot physically be there. A more informed treatment can save time and resources for patient and healthcare alike. Our mHealth solution facilitates remote patient monitoring (RPM) which helps healthcare professionals to follow their patients’ health and progress on a daily basis, which is especially important during changes in treatment, such as during a psychiatric medication change. Our mHealth solution can be customised to accommodate and help treat a diverse range of affective disorders, such as depression, anxiety, bipolar, and borderline personality disorder. The smartphone aspect of our mHealth solution has been used in research to track unique factors that may indicate the progression of mental disorders that may be undetectable in person-to-person contact, such as using voice analysis to identify changes within mood for patients with bipolar disorder. Another barrier that healthcare professionals may face is the selection of the right mHealth solution. Although there are currently 165,000 mobile health apps on the market, the selection does not have to be daunting. A good way to begin this selection is by identifying and specifying what types of disorders you would like assistance with from your mHealth app. Another way to narrow down the selection is through the identification of the mHealth solutions that possess quality stamps (such as CE Marks and ISO certifications) as well as a clinical validation. In order to obtain the certification, these solutions must have passed a set of agreed upon standards for medical devices that cover data security management and quality of material. We understand that using technology can be frustrating and difficult, which is why at Monsenso we offer several ways to get help from real people – instead of an automated service. We offer an interactive support portal and dedicated customer support team, as well as a detailed user guide. 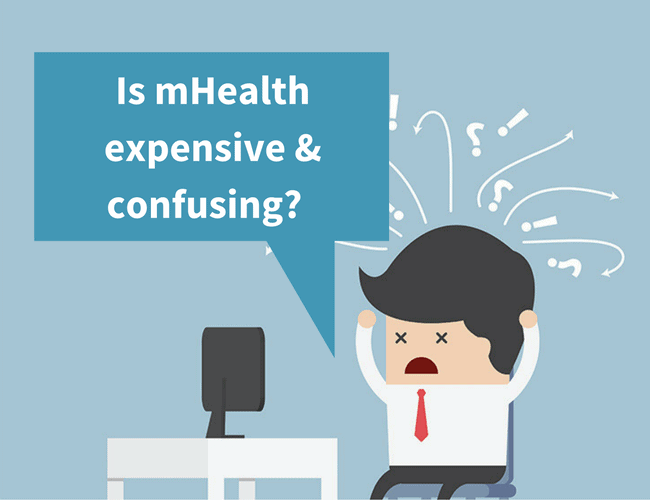 Still have questions about mHealth? Feel free to contact us or leave us a comment below. DBT is an evidence-based treatment that is commonly used to treat Borderline Personality Disorder. Online-based DBT solutions have been found to make treatment easier to manage for clinicians, by storing information in an easily accessible place through cloud technology. 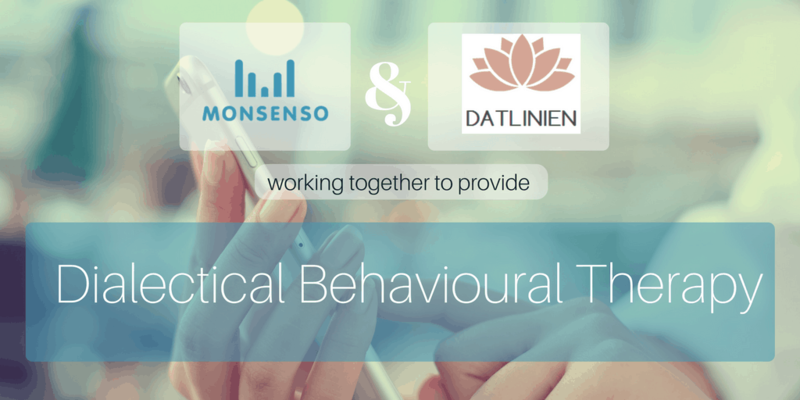 A new DBT module was recently added to the Monsenso mHealth solution as part of the mDiary Study, a research project done in collaboration with several Danish partners. 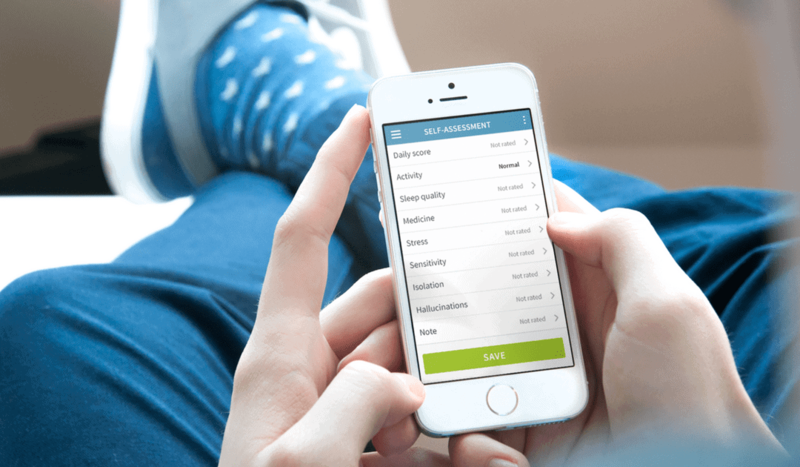 The Monsenso mHealth solution, which consists of a smartphone app for individuals and a web portal for clinicians, provides a reliable, efficient, and clinically-validated smartphone based approach to DBT. Some of the key factors of DBT include skills training and self-monitoring, which have been administered traditionally through paper-based self-assessments, workbooks and diaries. The Monsenso DBT smartphone app helps optimise and organise this process, by putting self-assessments, self-monitoring, skills training, emotion rating, and synchronized clinician feedback into one convenient location – your smartphone. Datlinien offers mental health services, with a special focus on DBT, to public and private institutions, and they provide DBT treatment for both group and individual therapy. The project, with a duration of 24 months (June 2017 – June 2019) and a total budget of 1.2 million Euros, brings together leading European research/academic institutions and SMEs. The IMPACHS project (IMProving Availability and Cost-effectiveness of mental Healthcare for Schizophrenia through mHealth), is done in collaboration between Monsenso, the Psychiatric Research Unit from Region Zealand, time4you, and the University of Hamburg. Cognitive Behavioural Therapy (CBT) is one of the most effective psychological approaches for psychotic symptom reduction, but only 10% of patients receive it due to growing shortage of professionals . Mobile-based CBT interventions (mCBT), as an adjunct to traditional care, provide a unique opportunity to deliver continuous, cost-effective, accessible, non-stigmatizing and timely support to these patients, promoting the detection of alarming symptoms and reducing the duration of relapses, observed in 80% of patients. The IMPACHS project aims to develop mobile- and context-aware CBT content, deployed through the time4you IBT® SERVER (eLearning) platform integrated into the Monsenso Clinic mHealth solution for mental illnesses that is HIPAA compliant and has a class 1 CE & TGA mark. The staff at the University of Hamburg have extensive knowledge on using CBT for individuals with schizophrenia and has published several research papers in medical journals related to schizophrenia. The project will leverage their substantial experience in clinical research within schizophrenia to develop the assessments and interventions planned. The Psychiatric Research Unit of the Zealand Region of Denmark will begin the trial using an improved version of the Monsenso Clinic that offers psycho-education through the integrated IBT e-learning platform that delivers continuous, cost-effective, and timely support to individuals with schizophrenia, complementing their therapy. Personalised triggers, defined jointly by individuals and therapists based on a person’s behaviours, can be used to detect symptom aggravation in real-time. Mobile CBT can help lower the severity of a person’s symptoms if the content is personalised and disorder-specific. The objective of the clinical trial is to determine the feasibility of context-aware CBT and psycho-educative content in the users’ recovery process. NICE Guidelines. Psychosis and schizophrenia in adults: treatment and management, [CG178]. London: Excellence NIfHaC; 2014. The ROI on mobile health apps is critical to ensure the feasibility and long-term success of digital initiatives implemented by a healthcare institution. On a previous blog post titled “Patient engagement – How important are mHealth tools?” we pointed out the importance for healthcare institutions to embrace mHealth technology if they want to meet consumers’ requirements. By boasting the consumers’ use of certified, clinically and technically validated mobile health apps, organisations could potentially have huge cost-savings in four particular areas. Addressing chronic illnesses: providing mobile health apps to people with chronic diseases such as heart disease, diabetes, and mental illness, can be a great way continuously monitor the symptoms and spot any relapses. Improving prescription adherence: A review in the Annals of Internal Medicine estimates that a lack of medication adherence causes nearly 125,000 deaths, 10% of hospitalisations and costs the US economy between $100 to $289 billion per year . Mobile health apps can be used to help improve adherence rates. As more healthcare institutions embrace mHealth initiatives, it is important to take into consideration certain aspects to secure an optimal return on investment and ensure long-term success. Aligning mobile health initiatives with an organisation’s business goals helps achieve ROI on mHealth solutions and better outcomes in the long run, and it also helps obtain the support of the organisation’s decision-makers. When an organisation’s mHealth initiatives are aligned with the overall strategy, this will also contribute to ensuring that the technology is rolled out on a large scale, instead of being implemented as small independent projects with a limited impact. Furthermore, when selecting and implementing an mHealth initiative, it is critical to involve both employees (because they will be using the system daily) and management, since it is up to the latter to ensure all employees understand the process involved in the roll-out, allocate budget and/or time for special training, and make the necessary changes to the organisational processes. Healthcare institutions that take a strategic approach by scaling internal resources across their organisations are more likely to make use of the transformational aspects of the technology. Instead of limiting mobile projects to a particular department, mobile health initiatives should be integrated throughout the entire organisation and become embraced as part of the organisation’s culture. Recognising when to select customised solutions and when to opt for existing mobile health solutions will help an organisation operate strategically and focus on business transformation. MHealth and Home Monitoring. Berg Insight. 2015.